If your stereo goes dead, your turn signals don’t blink, a light goes out, or some other gadget stops working, it’s often just the result of a blown fuse. You can change fuses yourself, easily and with very little expense. A fuse box located under the hood. The other is under the dash. 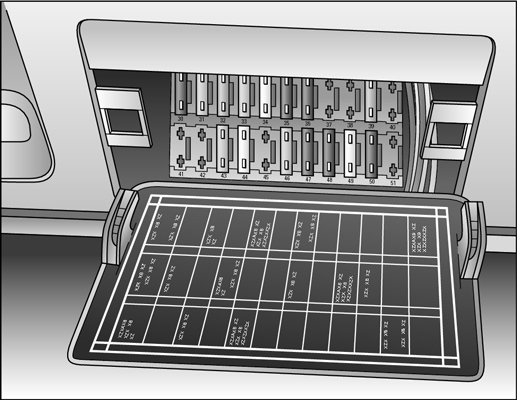 A fuse box located under the dashboard. Before you open or work on a fuse box, be sure that your vehicle’s ignition is turned off. Never replace a fuse with one that has different amperage than the original. The new fuse has to be the same color and size as the one you’re replacing. 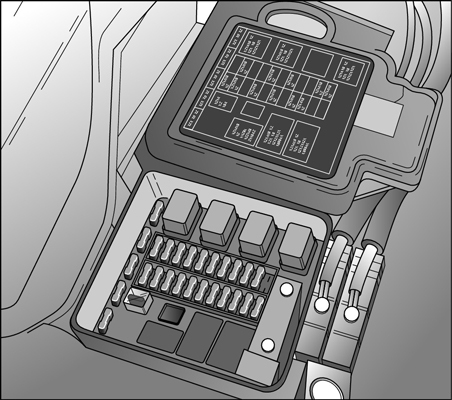 As you can see in the figures, the lid of each fuse box usually has a chart that shows you what each fuse is for and how many amps it is. If the fuse you’re replacing has different amperage than the one on the chart, someone may have replaced it incorrectly, and that may be why it’s blown. Most modern vehicles have blade-type fuses with prongs that plug into the fuse box the same way that appliances plug into wall outlets. They come in various sizes and are color-coded for amperage. You can tell if the fuse has blown by looking at the filaments visible in its little window. If they’re fused (no pun intended) or burned through, the fuse has had it. 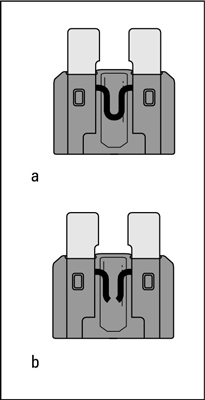 A good blade-type fuse (a) and a blown one (b). If you can’t just yank a fuse out, you need a plug puller. If you’re lucky, your automaker has provided one right in the fuse box. If not, try a pair of tweezers. If you encounter tubular glass fuses, look for one that’s black inside or no longer has its filaments intact. To remove this blown fuse, gently pry it out with your fingers, a very small standard screwdriver, a small set of pliers, or, as a last resort, a bent paper clip. 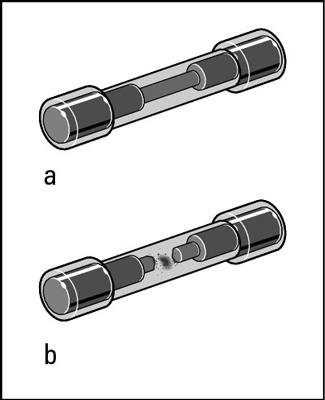 A good tubular fuse (a) and a burned-out fuse (b). To avoid breaking the fuse, try prying up one of the end caps first. If that doesn’t work, gently pry it up from one end of the center area. Inspect the fuse to be sure it’s burned out, and then gently press a new fuse into place. After you’ve replaced all the burned-out fuses, test the part that malfunctioned to see if it’s operating properly again. If it still doesn’t work, have it professionally repaired or replaced.